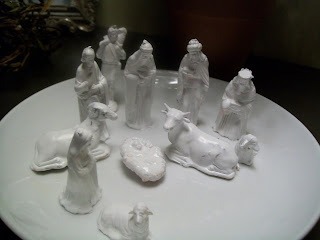 i've been wanting a nativity set for a while now, specifically the willow tree one, mostly for their adorable little lambs -- but mostly in a dreamy way -- not enough craving to save up or plunk down plastic for it. today i found my perfect set. you know when you find those mini (fairly ugly) little plastic sets? did you ever think of what would happen if you covered it in a few coats (or add a few more for me -- the one who let her five year old paint it orange first to occupy him while she coffee-ed with a girlfriend) of semi-gloss enamel? it's a beautiful transition and it's like my instant deck saga -- things are now just fine without the first image i had in my mind. i'm lucky enough to have the computer without the boys hounding me for it so now am off to type out some story. let me know if you are inspired to cover unattractive figurines with porcelain white too. FYI post script: funny things can happen when you are rushing the seasons -- my five year old told me today he knew where the wise men were buried. me: (impressed. very in depth sunday school classes, perhaps?) really? where? ok, so we need to do some prep for remembrance day and Christmas both. What a great idea to paint them! They look so beautiful.